Catch Me If You Can meets Tangled in this funny and feel-good romantic comedy, new from bestselling author Kaitlyn Davis, writing as Kay Marie. Addison Abbot is a dreamer—she dreams of owning her own cake shop, of traveling the world, of finding Prince Charming. But when it comes to actually following any of those dreams, she’s a little, well, stuck. 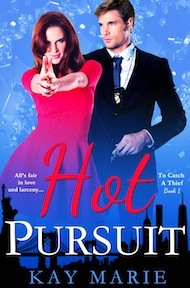 So when a devilishly handsome stranger saves her from two robbers with guns and pulls her into the adventure of a lifetime, she’s determined to find her fairytale ending—until she realizes he’s the most wanted criminal in America, that is. Thaddeus Ryder was just another run-of-the-mill international art thief until his latest heist went south. Now, his face is on every news station, his name is making headlines, and his partner is working for the feds. Talk about a bad week on the job. His only option is to flee the country. 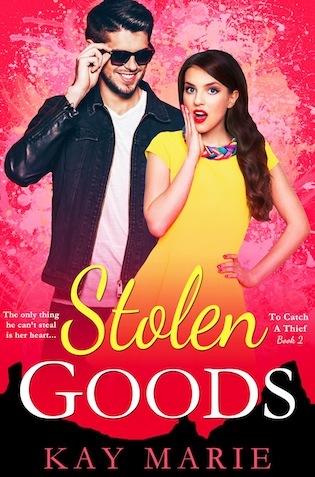 But when hitmen for the Russian mafia interrupt his getaway, Thad gains an accidental companion—a baking beauty who might be too tempting to resist.